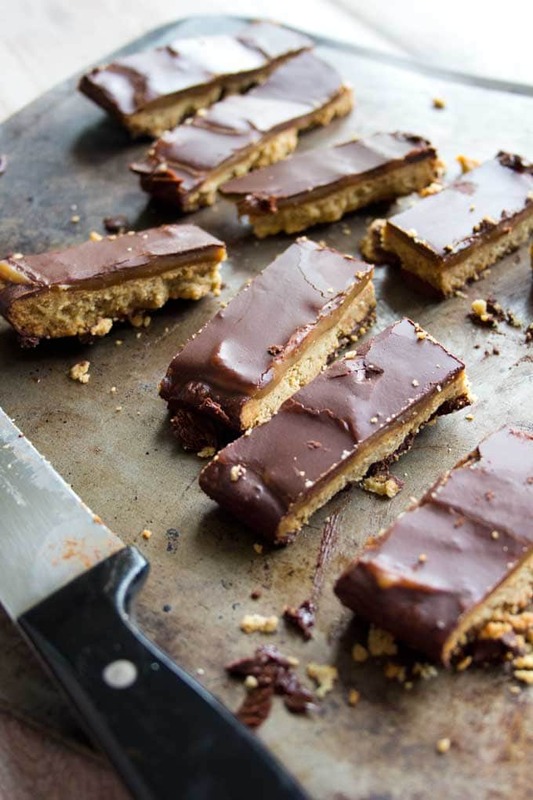 Low carb homemade Twix bars are a healthy version of an all time favourite candy. Enjoy a decadent treat without the sugar rush. Perfection, my friends, is overrated. Imperfection is where it’s at! It’s simple. Perfection is the opposite of fun. The way to the top of the pile is littered with failure, disappointment, nervous cramped stomachs and sweaty armpits. If you strive for perfection, you are telling yourself that anything less is not good enough. What a depressingly negative outlook on life. And anyway – will you enjoy life more if you looked like a supermodel? Will you have more fun if you have a home straight off the pages of the Architectural Digest? Are you going to feel true inner peace if Anna Wintour is jealous of your wardrobe? Will your existence be greatly improved if your kids win all the gold medals at school sports day? If your face is forever wrinkle-free? There you go. Imperfection is about being open-minded and relaxed. It’s about being able to think out of the box. About enjoying all aspects of life and embracing the journey. Friends, let’s be proud all our idiosyncrasies and peculiarities. Let’s be happy about who and what we are, because that’s what makes us unique, interesting, special – quite simply, perfect in our imperfection. And for goodness sake, let’s chill out in the kitchen! As long as a dish tastes amazing, is it really important how perfect it looks? Now you get my drift. I’m looking for some open-minded thinking here. Friends, these low carb homemade Twix bars would not pass the perfection test in terms of presentation. I had just made this 2 ingredient sugar free caramel sauce and was keen to incorporate it into a dish. Low carb homemade Twix bars seemed like the perfect candidate! In the recipe description below, I am putting forward two different ways to spread out the almond dough. If you roll it out between 2 sheets of baking paper, you’ll get it looking perfectly smooth and straight, which will most certainly result in a more handsome Twix. As you can see, I just pressed the dough into a casserole dish lined with baking paper. When I poured over the chocolate topping, the chocolate ran over and around the irregular sides and some settled underneath the almond base (which incidentally made it look more like a “real” Twix bar!). To make your low carb homemade Twix bars look 100% professional, you’d need to use a silicone mold like this. Pour some of the chocolate at the bottom, cut the baked almond base into the correct size, add the caramel and finish off with chocolate. Not difficult, a little more time-consuming but thankfully, absolutely not necessary. Because we’re all about the taste, right? 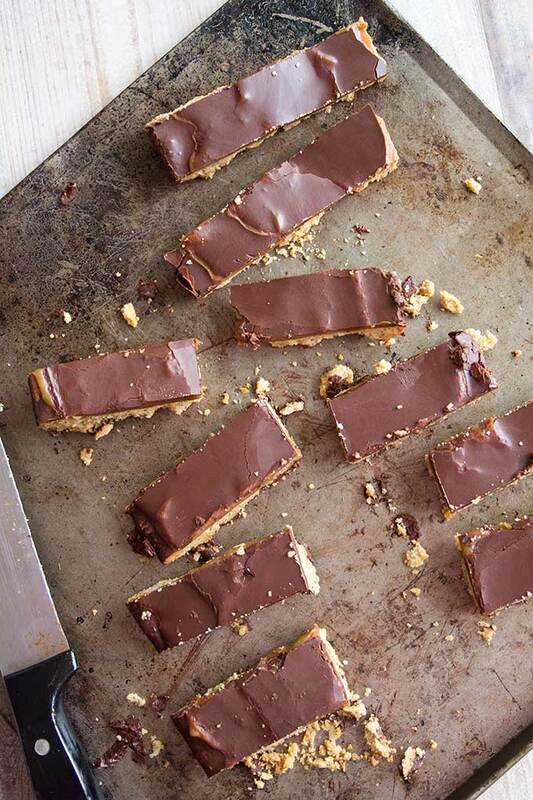 Once you bite into your very own healthy homemade perfectly imperfect Twix, you’ll know you’re in your happy place. If you are interested in trying your hand at other little morsels, you could also check out my sugar free pistachio chocolates or these matcha latte chocolates. 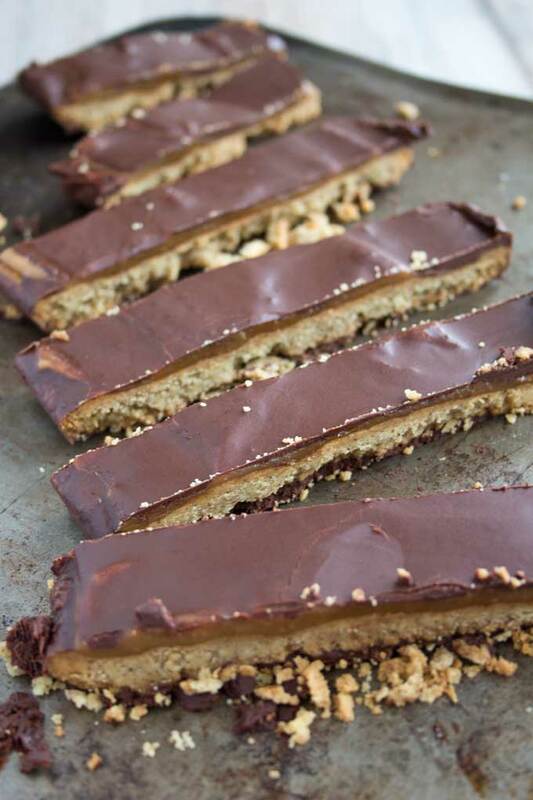 A healthy version of an all time candy favourite: low carb homemade twix bars! Enjoy the pleasure of a decadent treat without the sugar rush. First, make the shortbread base. 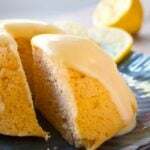 Simply mix the almond flour with the egg and vanilla. Either roll out the dough between 2 sheets of baking paper or line a 9x6 inch pan with baking paper and press the dough down evenly. Next, make the caramel. Bring the coconut milk and fibre syrup to the boil. Turn the heat down and let it bubble away gently until it has reduced by half. When the shortbread is done, remove it from the oven and let it cool down. 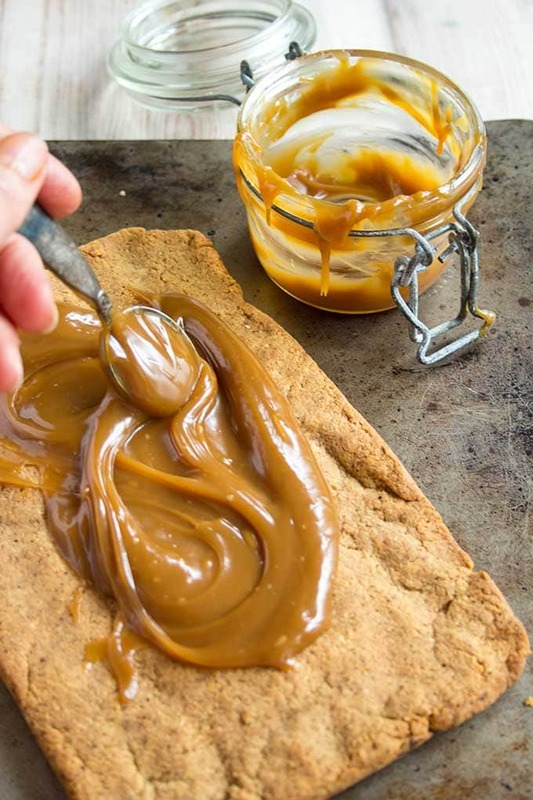 Spread over the caramel and place in the fridge for 10 minutes until it has firmed up. 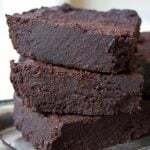 Now make the chocolate topping - either heat coconut oil in a pan until liquid and add the cacao powder plus 1 tbsp of fibre syrup. 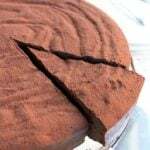 Alternatively, melt 80g of dark chocolate (minimum 85% cocoa solids or higher). Pour the melted chocolate over the caramel layer and let it firm up in the fridge. 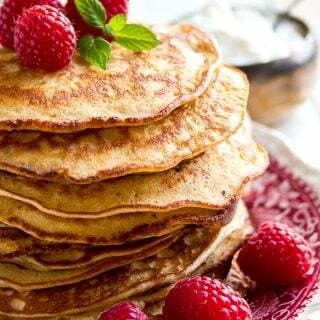 If you want to use a full can of coconut milk (normally 400ml), increase the amount of fibre syrup to 7 tbsp. You'll have some leftovers for waffles/ice cream or pancakes. Just put it into an air tight container and keep it in the fridge. These bars are quite dense and filling. I found that a good size was around 25g. Therefore, my bars ended up smaller than your regular shop-bought Twix. I have calculated the nutritional info according to a 25g bar. My first attempt at making this recipe I used method for caramel linked in this post. Mine turned out to be runny and not very flavorful. However, I tried again using Paola from Gnom Gnom’s caramel recipe and they turned out ASTOUNDING! Hi Katie, I’m glad you found a way to make the recipe work for you. In terms of the caramel from my site, I think you may not have reduced it long enough. OR the coconut cream you used was not as thick as mine. Or both 🙂 Anyway, if your twix bars were astounding, you’re happy and I’m happy !! Hi! 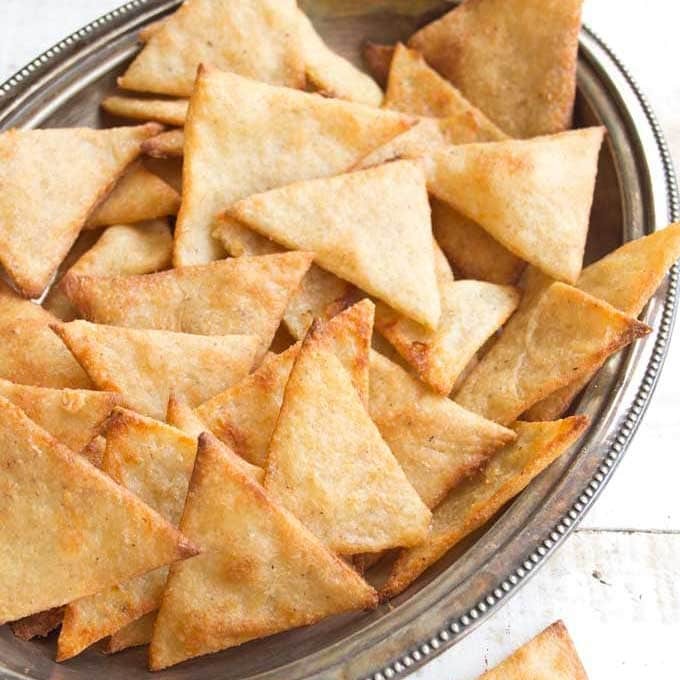 these look amazing, I was wondering will it work if I use oat flour instead of almond flour? 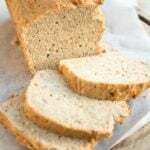 I haven’t used oat flour, so I don’t know whether you can replace it 1:1. Oats are more absorbent of liquid as nuts, but as it’s a dry base that should not be a problem. As for the honey, it does not contain the fibre of the syrup. My guess is you might have to cook it for longer for that reason to reduce it. It’ll be a bit of an experiment and I cannot guarantee you’ll get the same result, but it might well taste great! These look delicious, one of my all time favorites! Any idea on a substitute for the Sukrin? I can’t use it because it upsets my stomach horribly in even a very small amount. Monk Fruit seems to work best for me but wondering if it would be a good substitute in this recipe? 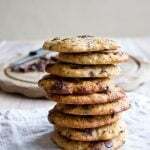 For the chocolate part, you can substitute with any sweetener that works for you, it could be liquid stevia or a granulated (or best powdered) sweetener. The caramel part is a bit trickier as you don’t want your sweetener to recrystallise. There are other sugar free syrups on the market, though I have not tried them. Maybe there is one that is sweetened with monk fruit? Hi Katrin! 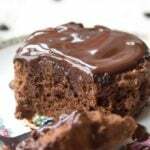 I’m definitely going to make these! My question is about the Sukrin syrups. There is gold and clear. Do you use gold for these bars, and do you also use the clear? What is the main difference between them? The description indicates gold has more of a molasses flavor. Hi Katrin. I am in Australia, and we record carbs and net carbs differently to other countries. We have total carbs, then deduct total fibre, which results in net carbs. I think you must be using another system. Can you tell me the net carbs for each 25g bar please? Hi Ann, normally this is exactly what I do, too. I use the nutrition calculator on the website sparkpeople.com. It has a feature where you can input nutrition information of products you use, which I did for the fibre syrup. To be on the safe side, I think you can take the total carbs and subtract the sugars from it. That would leave you with around 3.4 net carbs. I’m not a nutritionist and not 100% sure how these fibre syrups work! I hope this helps. 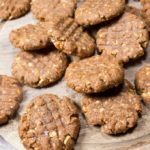 Hi Ann, I just did some research and found a different calculation for the fiber syrup on the website netrition.com – their nutritionists obviously must have known some secrets I did not. It states the syrup at 1 net carb per tbsp. I have re-calculated and posted new nutrition info. The net carbs per bar come in at 2.7g. Sukrin is not gluten free. It has barley malt in it and that is no good for celiacs. Hello Ginny, I just checked with the people from Sukrin. They assured me that they use the malt from corn and therefore it’s gluten free. 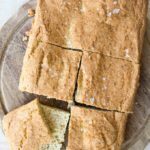 is there any substitute for the Fiber Syrup? It’s the fibre syrup that made the caramel layer lovely and gooey. You could try to use erythritol granules, but my guess would be that they would re-crystallise when they cool down. The syrup is worth getting – the taste is great, not “fake” at all, and it’s easy to use. 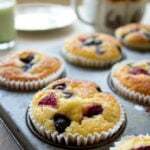 Hi Katrin, these look amazing and I’m going to make these later. Now assuming that I am restrained (haha!) and refrain from chobbling down too many, what do you think would be the best way of storing these to avoid the base going soft? Really enjoyed your post. Striving for perfection really is the wrong approach. Especially when it comes to diet. You need to take it day by day and focus on progress instead. We are not meant to be perfect. Twix bars! What a great idea. I love it when you make candy bars sugar free. I have made your Kinder Milk Slices and they went down a treat. I’ll DEFINITELY make these. OMG cannot wait to try these. I love Twix bars and have been pining for one!! They look really good! It’s a good sign when food doesn’t look perfect. That means it’s homemade!! The homemade look rocks, haha!